Dharmasena cradled the newborn, his heart leaping every time he saw her move in his arms. The infant settled into his warmth and her cries faded into drowsiness. Her half closed eyes rested on her father. "Father's pet!" Katyayana exclaimed, touched at the mist in Dharmasena's eyes. "She is going to take after you, Dharma!" Dharmasena was too taken by the infant to notice the personal address. The priest smiled and continued, "She will excel at anything she sets her heart upon! But the planets choose to show me more about her heart. Fearless to the core, she will become the shelter, the refuge to many. She will travel across the breadth of Bharatavarsha. Her company will comprise of the royalty, nobility and the commons. In other words, she will take after you, Annadata." Fearless, shelter, refuge. The words fell upon Dharmasena's ears the very moment he saw the tiny lips curve into a smile. "Abhaya,"he said. 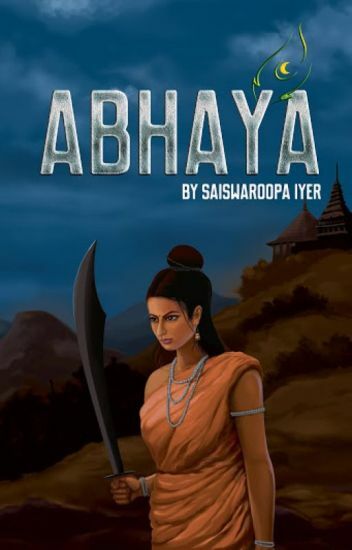 "Abhaya, the daughter of Dharmasena"
A story about the Aadshakti, Param Parmeshwari, the base of universe, The one who is omnipresent, everloving Mata Mahalakshmi and Her forms. This story is about her, her forms, her incarnations, the one who is Shri Hari's shakti, Vishnuhridayvasini, who always feels pleasure serving lotus feet of Sri Hari. The one who is JagatMata, Parmeshavari, worshipped in many forms, The Parabrahman Swaroopani. This book is all about the stories related to her, from Satyayuga till Present, her devotion, her penance, her plays, her love and her love for each and every soul. This book will have tales about all her forms, and Maa Vaishnavi, also Known as Sherawali Maat Bhawani, who is also her form, will have a major part in this book too. This book will have tales about Sita Maiyaa, who had her numerous plays on earth when she came with Bhagwaan Sri Rama, as her soul companion. This book will have stories about Maa Radha, Ashtmahishis of Sri Hari as Krishna, who gave their all and helped him doing his purpose on earth. Join me in the journey of knowing a bit about Aadishakti Mata Mahalakshmi. History is always written from a king or prince's perceptions, not from eyes of a queen. Ashoka and Tishya are no exception to this rule. Their relationship is built on unusual circumstances. One is a king while other on all probability a daughter of a fisherman. Intriguing Isn't it? With the same interest I try to take this story to give benefit of doubt to Tishya. After all History is constantly changing. With new discoveries, we shift to new theories. It is similar to filling up blanks. If you have read about Ashoka's life history in the Internet, TishyaRaksha would not be a new word to you. There are many articles scattered over the vast spheres of the Internet telling us how bad she was. She tried to seduce a son of Ashoka named Kunala etc. Personally, I always think that everybody has their own versions of stories to say. Unfortunately, only winner's or powerful person's version get registered. Mostly society considers step queen mothers as vile manipulative even debaucherous. While the stepsons are outright virtuous with a halo surrounding their head. As every coin has another side, Tishya could also have her views. Maybe she is caught in a coup or something that led to her death at hands of Ashoka? At outset Iam not prejudiced over TishyaRaksha,but I have strong historical research backing augmenting by hypothesis. So I request you to support my effort. Course of true love is never smooth. Mrinalini and Chandragupta 's story is a testimony to this. Chandragupta is an ambitious military adventurer who is guided by his teacher. Chanakya  the world revers for his unparalleled wisdom. Chanakya wants to overthrow a tyrannical dynasty led by Dhanananda. Chandragupta is his tool. Meanwhile Chandragupta sees his childhood sweetheart  Mrinalini. Their eyes join and love blossoms. Chanakya  initially he did not see Mrinalini as a threat until She gets pregnant with Chandragupta's child. Chanakya did not want Mrinalini now in his protege 's life as wife. Chanakya  feels the son would implicate a serious threat in future. He believes prince from royal family is good for kingdom he wishes to create. So tactfully he obtained a promise that Mrinalini wouldn't disclose her child's paternity before public. Can Mrinalini and Chandragupta manage this ? Can Chanakya change his stand? Along with an umpteen questions unfolding after each answer. .. Her red lips curved into a beautiful smile, as her eyes took in the form of MahaVishnu. She shone like a diamond in darkness, pure and unsullied, the radiant Sun and the calming Moon. Her skin tone varied depending on how she was viewed. Her eyes were the shape of the Lotus, fixed on the feet of MahaVishnu, as all denizens of the fourteen worlds, watched her. Kashyapi. Mahalakshmi, the One who resides as Narayana's heart, takes birth as the daughter of Brahmarishi Kashyapa and all his wives. Bearing the Universe, Her Bhu form's special presence was dominant in the daughter of Kashyapa. This story is about She who bears the Universe, and Her reunion with Her Vishnu, in the form of Prithvi. Chandragupta and Mrinalini are meant to be together. They will find their way back no matter how long the distance between them. This story is dedicated to their reunion. Even though wattpad has millions of books, but there isn't a single book which has a complete explanation of the great Lalitha sahasranama, which is said that only blessed people could have the opportunity to even hear it.. I wished that every child of our divine mata Adi shakti should enjoy its bliss.. This is a total spiritual book , where I will explain the magical Lalitha sahasranama with its meaning from a daughter's perspective..
Cursed from birth, known as a disgrace to his father. He had to fight his 100 brothers for the throne and had a rage that not even he could conquer. "Shalt come", the old lady repeated. The girl looked at her in stunned silence. "The fire shall come and burn this entire kingdom", she pointed at the girl, "And only you will be able to stop it!" This story revolves The Evil Putana and Shri Krishna. This one shot story if for The Krishna Bhakt Contest.